If you are thinking of buying an underwater camera, it is important to choose a model that best suits your needs. You may have come to our site looking for a compact model that will capture some great vacation memories, enabling you to take still and video shots in the sea or the pool. Alternatively, you may have aspirations to be the next David Doubilet and want to develop your underwater photography technique by getting a model with enough features to enable you to improve your technical skills. For most of us, the reason for researching the wide range of waterproof models available lies somewhere between these two scenarios; we want a reliable, easy to use way of recording our vacation memories but we want something that is fun and interesting to use and gives great results. We also want to be sure that we have got the best value for money and got the specification we want at the price we are prepared to pay. This site will guide you through the evaluation and buying process, helping you to make an informed decision so that you choose the best underwater camera for your requirements and one that will get a great deal more use than on the annual family vacation! They keep out all dust. Dust can be a problem in ‘conventional’ cameras and can seriously affect picture quality if it gets into the lens or sensor. As it can be difficult to get out if it gets in, so this is something to avoid and a sealed casing makes this possible. These cameras are really tough! This makes them a great choice for older children, teens and for those of us who tend to be somewhat accident-prone as they are shockproof and durable enough to withstand knocks and drops in daily use. They are great for vacations out of the water too. If you are a winter skier for example, most models will withstand winter cold down to around 14° F (-10 C). If you are heading for a tropical or humid destination, there is no danger of the humidity affecting the camera. Another feature of some of the best underwater camera models is that they come equipped with GPS. Your pictures will not only be digitally ‘stamped’ with date and time but also, the geographic location if you choose to have this turned on. You will understand what a great feature this is if you have ever looked back over vacation snaps from a few years ago and wondered where on Earth they were taken! What Are The Downsides Of This Type Of Camera? Some models do not have the viewfinder screen that we have become accustomed to with our ‘conventional’ digital cameras. Most compact waterproof cameras have a maximum of 5x optical zoom because it is just not possible to extend the lens for greater zooming because of the limitations of the sealed case so they are not suited to getting great close-ups from distant objects. If you are using an underwater camera both in and out of the water, you will need to remember to wipe the lens after using it in the water as droplets can dry leaving a film of salt, limescale or other deposits on it and these can affect the picture quality if left. A good tip is to care for your camera as you would your wetsuit! Rinse it in fresh, clean water after using in the sea or a swimming pool. Optical Image Stabilizer to avoid camera shake when shooting video and images in low light situations demanding slower shutter speed. Neck straps versus wrist straps are a matter of personal choice, but some means of preventing your camera from becoming detached from you in the water is even more vital than it is on land. For water sports and under water use, an easy-grip camera is essential. One hand operation is also very helpful. When the action is happening fast around you, (a shoal of fish swimming by for example) a continuous shot mode enabling a rapid burst of single shots will ensure you have captured some stunning images when you come to review your pictures later. Models that provide additional illumination via an LED light source can be useful for low-light situations. Look for a model with an ‘automatic’ mode so you can take snaps quickly on the go and not miss an amazing shot because you did not have time to adjust settings correctly. For more serious photographers, having the facility to use specific features for underwater photography will not only make things more interesting but will also get the very best results. 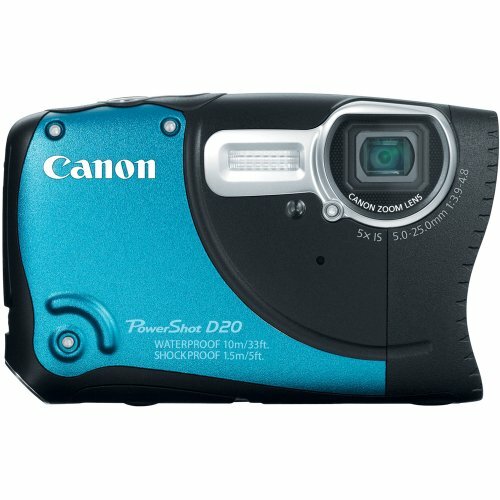 The Canon PowerShot D20 ticks all the boxes for features, ease of use and stunning picture quality in both still and video images. This 12.1 Megapixel camera with full 1080px HD video recording via a dedicated movie button has a 28 mm wide angle lens enabling 5x optical, 4x digital and 20x combined zoom and 3″ LCD viewfinder screen. Waterproof Up to 10 meters the PowerShot D20 has a wide temperature operating range (14°F-104°F), is shockproof to five feet, DIGIC 4 image processor and GPS tracker (does not work for underwater images). The optical image stabilizer and effective CMOS sensor for reduced ‘noise’ ensure bright, clear images, even in very low light situations without the blurring that can be caused by camera shake or zooming. Neat features such as a wind filter on video recording to avoid muffled sound, the ability to use the full range of digital zoom and to record in AppleÂ® iFrame format makes this camera model an ideal choice for shoot sport, action and underwater movies. The TG-830 produces brilliant images thanks to the 16 mp backlit CMOS sensor and the Olympus TruePic VI image processor. It is great for action shots because of its high speed, highly responsive performance. It is even equipped with an LED illuminator for better results in low light situations so it is perfect for underwater photography and night shooting too. You do not have to be a technical expert to get brilliant images and top quality 1080p full HD video from this GPS equipped model. You will always know exactly what image you are capturing thanks to the high-res. 3″ LCD screen and you won’t even have to choose between shooting stills or video because you can do both at the same time via the multi-recording function. You can also choose to record video at 120fps if you want to enjoy slow motion play back. Waterproof to 10 meters, crushproof, dustproof, shockproof to 2 meters, freeze-proof to 14°F – as Olympus say, it’s “Lifeproof”! 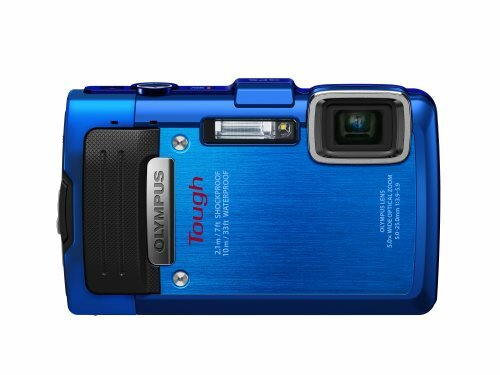 This rugged 16mp camera has a wealth of clever features to enable even a beginner capture brilliant still images and full 1080i HD video. 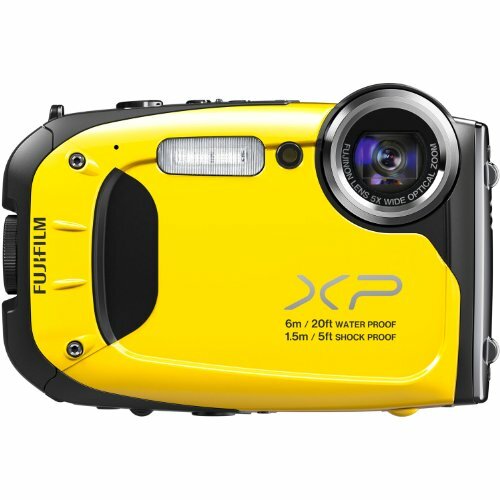 The XP60 is dustproof, waterproof to 20 feet, freeze-proof to 14°F, shockproof to 5 feet, and equipped with a 28mm wide angle 5x optical FUJINON zoom lens and 10x intelligent digital zoom. Great images even at very low light conditions thanks to the 16mp CMOS sensor, the optical image stabilization feature that reduces blur due to hand shake or camera zoom and the auto recognition feature that automatically configures settings to optimize images. Movie recording at up to 240 frames per second allows for freeze frame and slow motion playback. This feature, coupled with in-camera movie editing and noise cancellation so you don’t hear the lens zoom on playback makes the FinePix XP60 a great choice for video recording. For stills photography, the filter features for special effects, the 360° Panorama option and so many more neat features give the FinePix the edge when compared with other models in this price band. At this point, you will have read through our underwater camera guide and also reviewed our considerations, we trust that you are in a far better position to come up with an educated conclusion regarding the model of camera you have a need for. To be clear of the options which will be important to you from the beginning is a good way of avoiding a costly mistake.